This is not a normal March for us. It has been way too cold – 20+ degrees below normal for the highs, lows in the teens and twenties, and 50 degrees lower than March 2012. As I have been working this month, snuggled in my studio, the wind has been blowing and the snow flying. In fact, this last snow storm on Sunday night set records in not far away Indianapolis. We were fortunate to get a lot less snow than they did , but – this is spring? 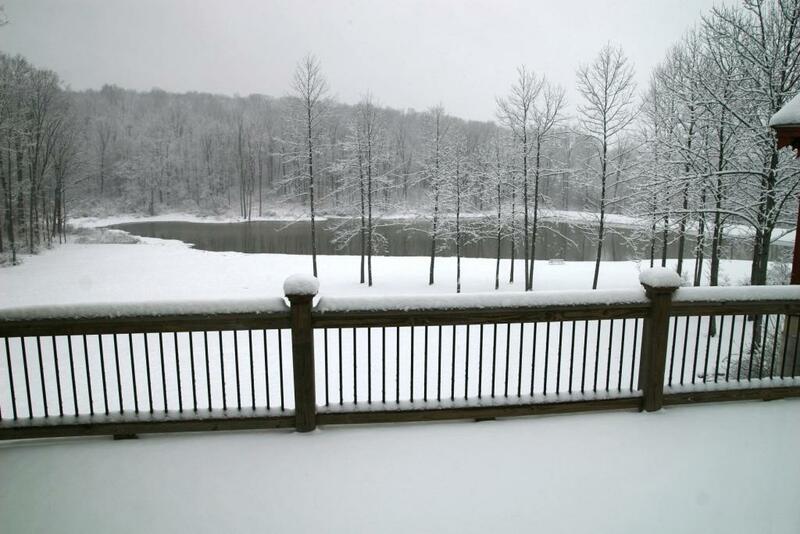 I bet we had over 4″ by the time it ended. I didn’t go out to measure. I wasn’t that curious and gauged it from the railings. It melted off of the roadways and sidewalks by afternoon and ended up being quite pretty. When I went out, the roads were totally clear and a lovely, deep snow covered the trees and the grass. It is almost all gone today. We have been seeing a bit more wildlife this month. The transient waterfowl are passing through almost every day. In fact I saw a coyote checking out the ducks and geese from the far shore. The birds actually approached nearer to the shore to honk warningly at him. They got so close he seriously thought about jumping in but then thought the better of it. It was too far to photograph with my telephoto lens or I would have a picture. He really didn’t have a prayer of getting one but it surely crossed his mind. I have also seen a large flock of turkeys – mostly toms I think – strutting in the grassy area across the lake and over the lawn several times. There seems to be about 20 of them and they are HUGE. 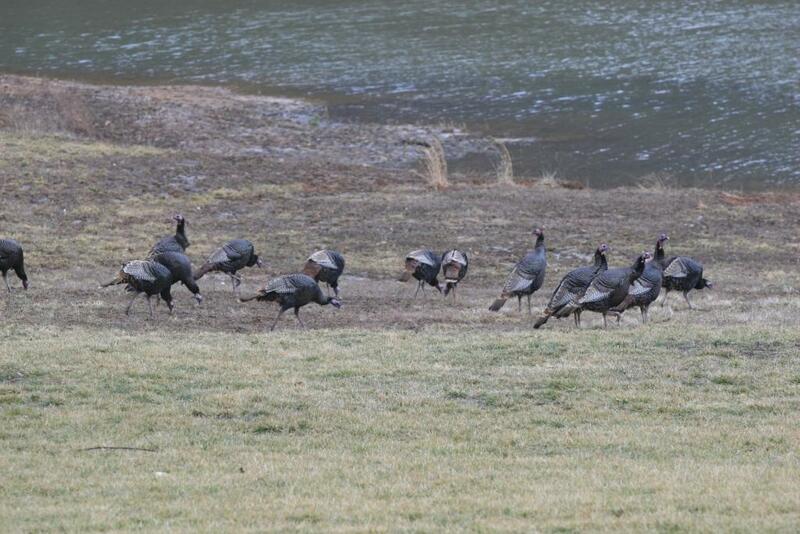 Some are definitely toms with large wattles hanging off of their chests and a few with smaller wattles. Some don’t have a visible wattle but the head is red and they seem to have large tail and wing feathers. Last years babies? I don’t know enough about turkey behavior to tell know if there are mixed flocks this time of year, but if so, those are some very large hens. I have worked on the architectural but need to let it sit for another day or so. I sprayed it lightly to pop the colors, but it needs a bit of depth yet so I want to get new eyes for it. It has been one of those weeks and I didn’t have much chance to work on the architectural. I managed to get some time in this weekend and laid out the basic color palette. This one has a bit more brownish brick than many of the previous ones, but it contrasts well with timber work on the gables. 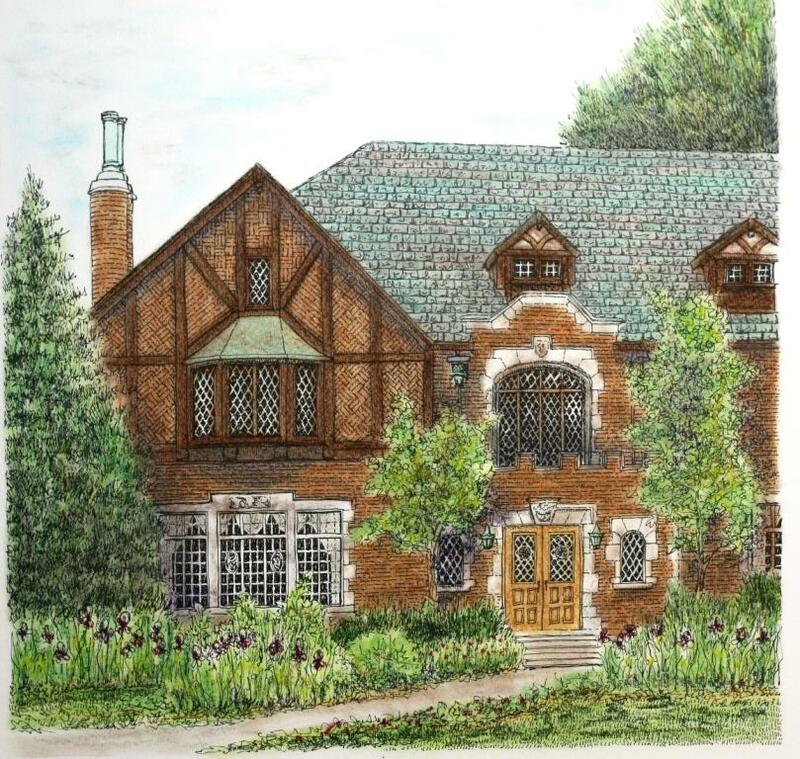 The fancy brick patterns ended up being fun to do and added a lot to the overall look of the house. I like the balance of the greenery thus far, so next sitting I will enrich the colors and shading. Then I will add the spray and see what happens and what touch-ups need to be made. I will probably redefine the ink work in some areas also. The colors are still on the dull side of course because I haven’t sprayed it yet and also I had to take the picture inside under the lights. It is snowing. Again. Possibly a big snow. Will this winter never end? I’ve finished the vast majority of the inking today. 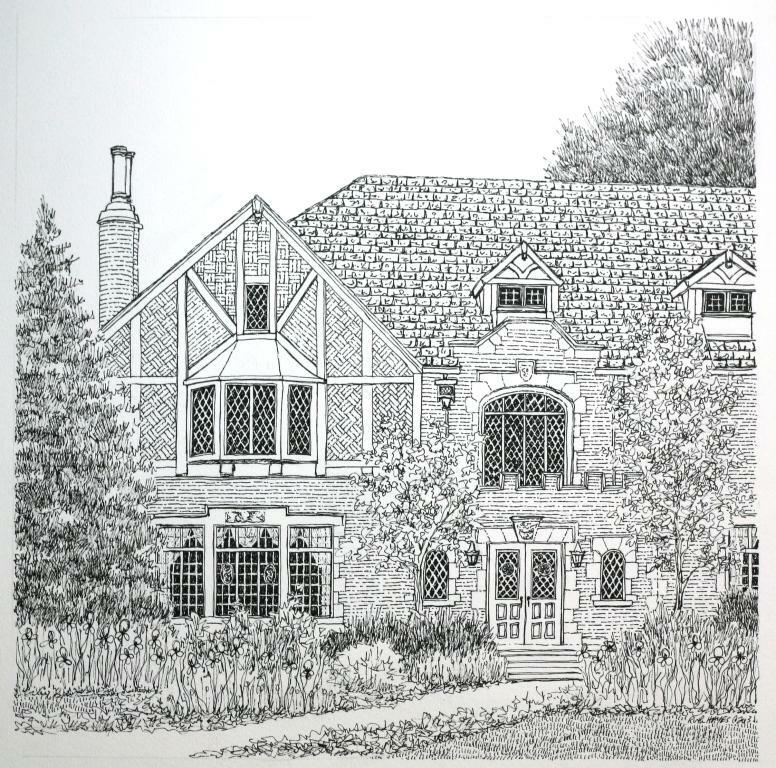 I rather enjoyed putting in the gable brickwork, once I figured out a system to lay down the patterns. I really would like to have talked with the masons who installed the brickwork in this area. There are so many creative variations and it was probably not thought of as unusual at the time. I guess it is too expensive for most houses these days. All in all, I am pleased with it at this stage. The pastel will be a bit more brown than red and the limestone accents will be gray of course. I think the crenelated deck turned out okay and I will define it more with the shading. I also like the shape of the double chimney. I am rather surprised that the house didn’t have more of them but at least it adds visual interest to the left side of the house. 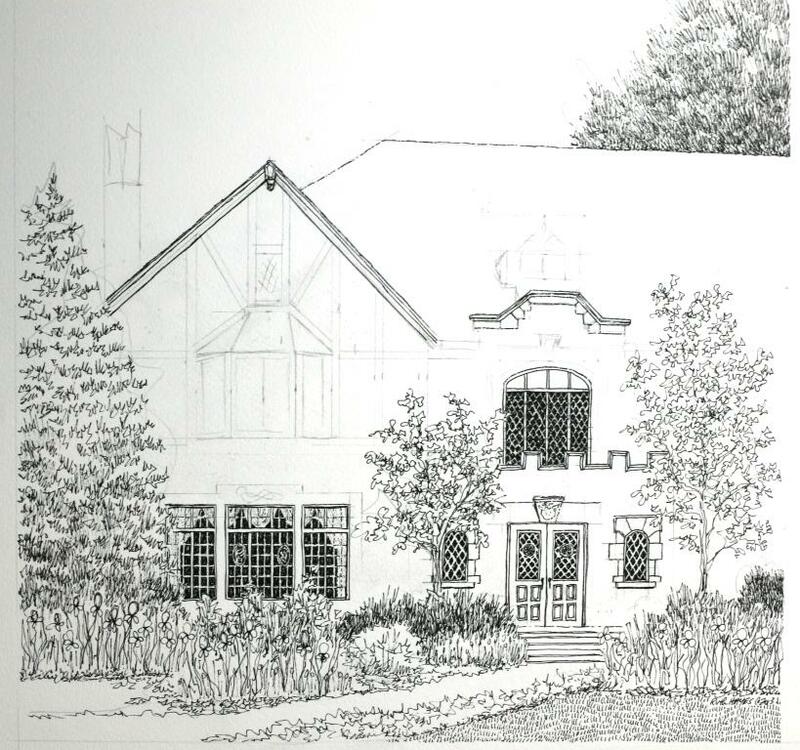 I had a few hours to start inking the latest architectural so, as usual, I started with the front landscaping. I think it helps me organize and define what I want to do. I tend to work front to back with the plantings and then move to the windows and door. Lastly, I will put in the brick and the slate roof. I have simplified and organized what was in the yard, taking out a front fence and adding a few more flowers and shrubs. It is shaping up well and actually progressing fairly quickly. I know I have to add depth to the fir tree on the left. I just wanted to start defining its basic shape at this point. 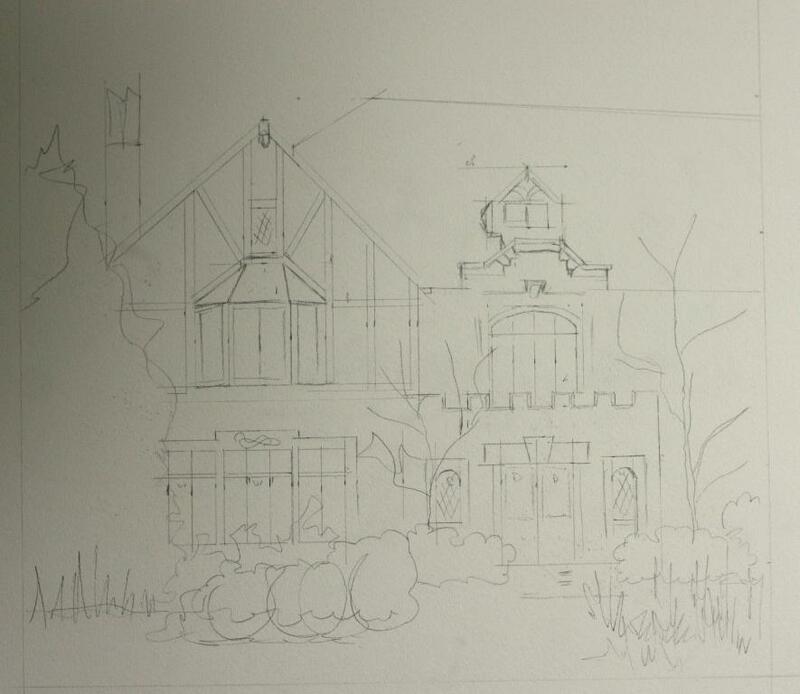 I’ll probably work on the bay window and timber work next. At last we are getting rain instead of snow. A gray day today, but that is fine with me. The temperatures were in the 60’s yesterday so spring is on the horizon. I have been looking at working with this set of photos for a quite a while, but have been slightly intimidated by the deck behind the crenelations. I need to define its presence to separate the fore structure from the large window and the perspective works against it. I decided to just dive in and let the shading handle it. The soft brownish brick has accents of limestone surrounding the windows and door. The whole left gable has zig-zaggy brick for added visual interest. The bay window is a weathered copper and the roof, as would be expected in a home this elegant, is slate. The pencil up is mostly finished and I will start the inking today. Sorry about the paleness of the photo, but the pencil never shows well on the very white board. This one doesn’t feel quite like a true Tudor to me because the timber work looks somewhat like an afterthought, but I rather like it anyway. 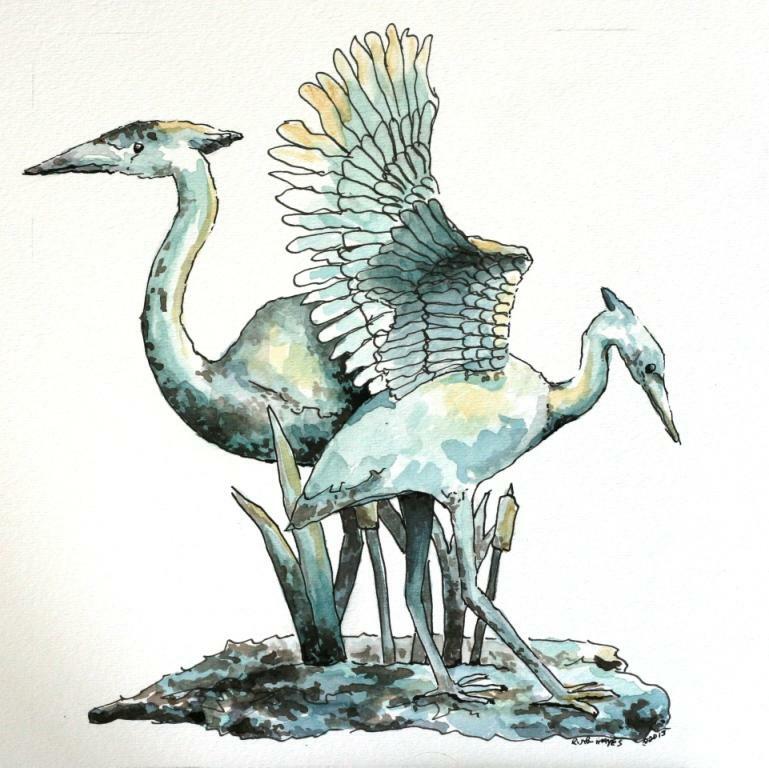 I spent the last two days painting the heron sculpture drawing. Most of it was finished yesterday but I wanted to wait overnight to add in the darkest parts. When I first started I thought I would add magenta to the teal/turquoise blue. I thought I would just leave the white paper as highlights, but after a few small strokes the purple didn’t do quite what I wanted so I stopped at that point. Later it came to me that yellow ocher might be better as a highlight . I played around with it and the teal and when I felt I had reached a stopping point, I decided to reconsider what to use for the darkest areas. I liked the way the color had developed but it still definitely needed depth. I debated long and hard with myself how I wanted to do it. I had a thought of using a spatter technique as a mimic of the sculpture’s finish but I would have had to frisquet off all of the background before I could do that. I was also concerned if I could lay it well enough to emphasize the areas I wanted to, but not overlay in others. I ended up using a dark sepia and am fairly well satisfied with it. It has been cold, cold, cold here the last few days. And more of the same plus the possibility of sticking snow on Tuesday. March – in like a lion…… I am so ready for spring this year. My daffodils are coming up – no surprise there – but nothing else is budding out yet. Last year with the very mild winter everything came out way too early and when a not so late frost hit, a lot of the new growth died, never to be fully replaced. Add that to the last three years of moderate to severe drought, and I am hoping for some normal spring and summer weather for a change. Maybe the colder temperatures have killed off the tree scale, too. Aside from the damage to the trees, I really didn’t like walking under a shower of sticky insect poo to get down to the lake. It was that bad. Yesterday Tom and Jerry, the male turkeys. made their way cautiously across the back yard at a somewhat leisurely pace. I haven’t seen much of them or the hens this winter. Ditto for the bucks. We have seen quite a few of the does and last year’s babies, but the bucks have been hiding out. Don’t know why. The Canada geese have been moving about lately, but what I enjoy seeing are the transient ducks. We keep hoping some will stay for the summer, but no luck yet. Maybe we will put up some duck boxes on the other side of the lake. We have seen quite a few ring-necked ducks as well as the usual mallards this year. 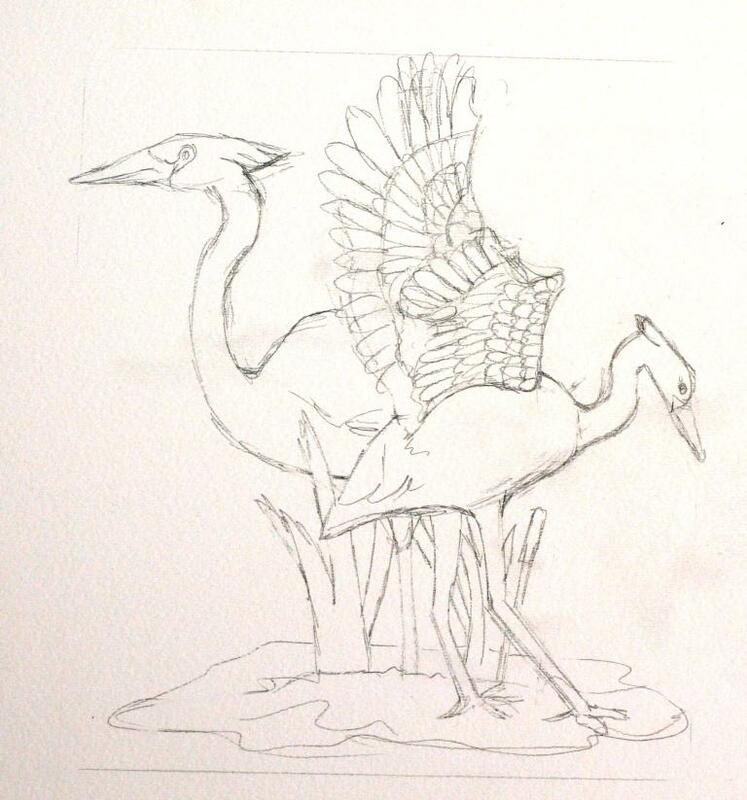 I still feel like painting a bit so I have taken a small sculpture of herons I received as a gift many years ago and penciled it up. I will look at it tomorrow and see if I still like it the way it is. Sometimes the hardest thing for me is to start the inking. I get attached to the drawing and am “afraid” of ruining it.